There’s been a great conversation regarding the work of Mike Dawson this week, somewhat self-inflicted. Dawson posted some honest to god numbers about the number of books he has sold and talked really frankly about his work and his audience. 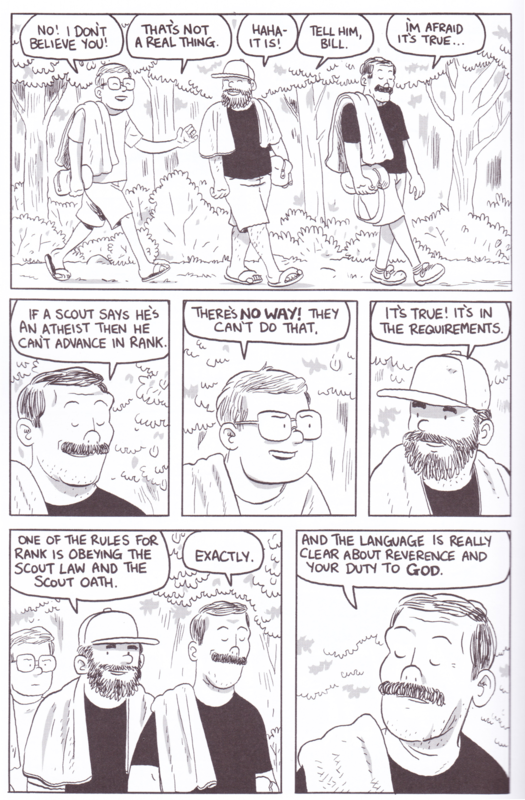 I honestly didn’t know anything about Mike’s work until earlier this year, when I bought his second book, Troop 142, at the Secret Acres booth at TCAF ‘14. As a former scout, a quick flip through showed a lot of the things I remember from my scouting experience in the late 90s-early 00s. A read of the book late last month showed more of the activity that I remembered from scouting – the roughhousing, the idiotic talk of boys who don’t know anything about women, the personal growth and exploration. But Troop 142 tackles some of the darkest memories of my scouting experience as well – the institutionalized homophobia and expulsion of agnostics and atheists. Dawson manages to discuss ideas through a slice-of-life storyline that is driven more by the passing of days than any particular plot. David and David, younger boys in the troop who are attracted to each other, deal with bullying and their anger in a very “scout-sponsored” way. The boys are horrified when called “boyfriends” as a joke, and lash out in anger with slurs that ultimately attack themselves. 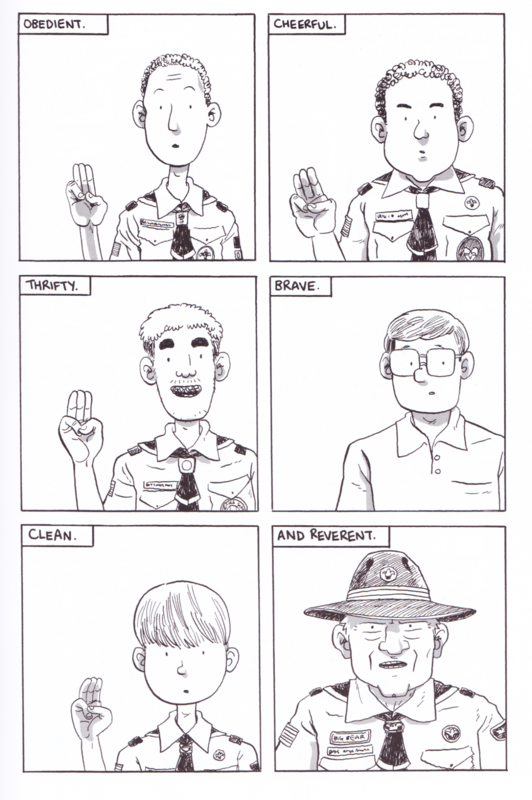 Dawson captures the way that young men communicate very well in Troop 142. And while Dawson wants to draw attention to these things, Troop 142 is more about vulnerability and the social constructs of adolescent groups than the politics of the scouts. We see boys getting picked on and see egos swell and burst. Fighting breaks out at a moment’s notice over tiny slights, small moments that turn into life-changing moments. Dawson’s cartoonish illustration style lends it to this kind of story, where the subtleties of human interaction can clearly be displayed on faces that are somewhat larger than life – Dawson uses different body shapes and facial features to differentiate between a large cast of characters, but I admit that I still had problems telling two characters, Jason and Matt, apart. It doesn’t help that the two are seen in a lot of scenes together. 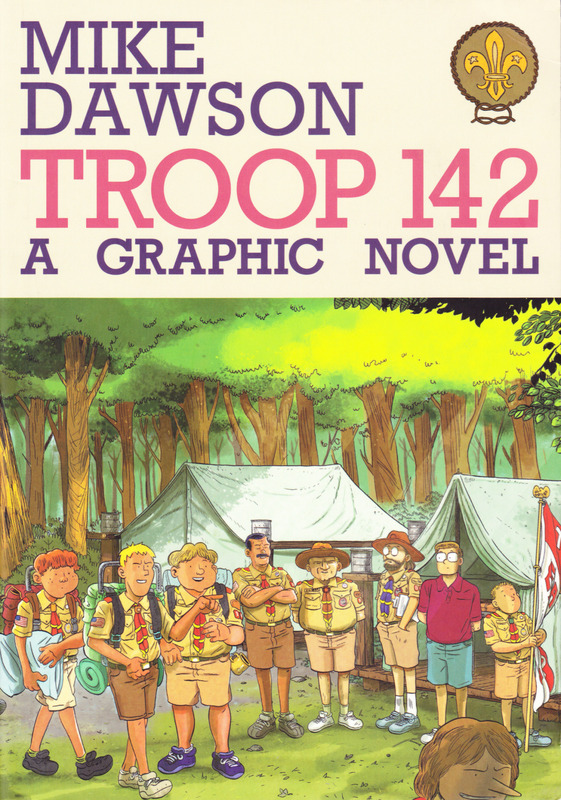 I feel like this could have been avoided, given the amount of revision that Troop 142 went through before it was published in book form. I picked two specific pages that I thought were very well placed at a second read – boys and men from the story all recite the Scout Law – “A Scout is trustworthy, loyal, helpful, friendly, courteous, kind, obedient, cheerful, thrifty, brave, clean, and reverent.” In some way, the tenet of the Law that each boy or man recites is their biggest character flaw, and it will take some time for these flaws to show themselves throughout the book. This was a really interesting composition decision that paid dividends later on. 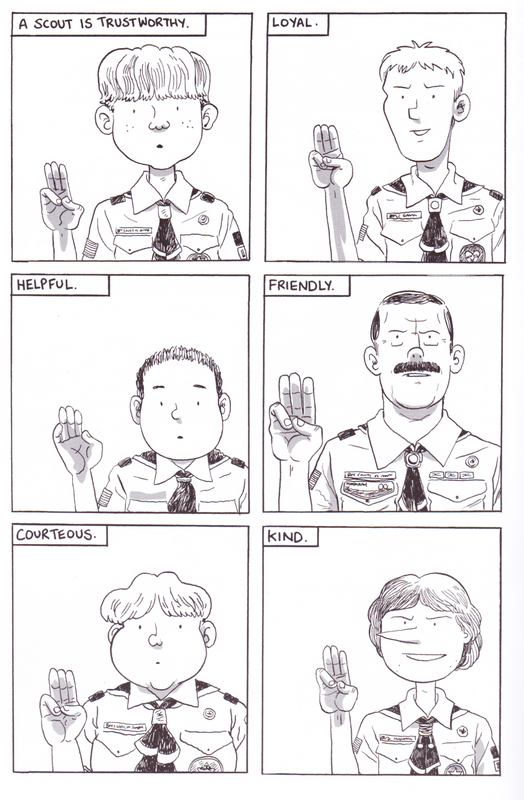 Overall, Troop 142 is hard to categorize. Dawson has created a complex and multifaceted work, simultaneously discussing the politics of a gigantic organization and the emotional frailties of its members. But I think more importantly, Troop 142 carries the weight of these things in the small moments of campfires, tents, and merit badges. Which, honestly, is just like real life. 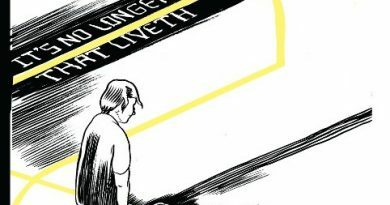 Mike Dawson is an Ignatz winning cartoonist and hosts the TCJ Talkies podcast. You can find him at his twitter page or at his tumblr account, mikedawwwson. Secret Acres is an independent comics publisher based out of Brooklyn. You can find their twitter account here.